HEALTHY lifestyle and fitness for life are the goals for business entrepreneur mother-of-two Donna Ellis. Donna wears many hats in her busy life - wife, mother and small business owner of Light Blue Lifestyle and The Lunchbox Lady. Not happy with how her life was heading, Donna decided to take control of her lifestyle and get her diet in order and has now turned her hobbies into enterprising businesses. "I know that eating fruits and vegetables are the best for optimal health and I tried (to increase) the intake on these by juicing and blending smoothies and even having a bowl of steamed veggies for lunch," Donna said. "My trolley would resemble a farmer's market and I wasn't feeling a change so I worked on an alternative solution." Light Blue Lifestyle gives a healthy eating alternative with a difference to ensure customers don't miss out on their nutrient intake. It is a simple concept of taking a fruit or vegetable, crushing it up and making a puree out of it and then freeze drying into a powered form suitable to be put into a capsule. Donna has taken this concentrated form of healthy eating and made it into a successful little business. "For the price of a coffee each day, you can eat healthy per day getting your nutrients," Donna said. The second business Donna has just set up and running is The Lunchbox Lady and baking healthy treats for school children. 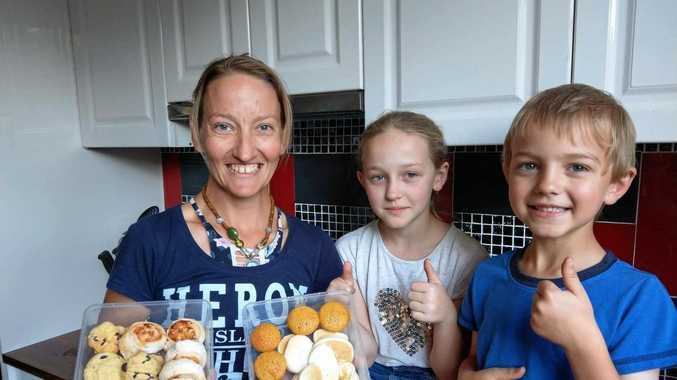 Donna first started baking healthy snacks for her own two children rather than sugary ones that are plastic wrapped from supermarkets. Word of mouth got around and now she does it as little business venture. "I do these healthy snacks for busy parents with school children and there is a choice of different flavours," Donna said. Parents have to organise some fruit and a sandwich but the beauty of the snacks is they are a great alternative to unhealthy snacks. The healthy snacks come in a lunch pack (currently two containers) and suit one child for five school days and are freezable. There are four different- flavoured packs for the customer to choose from to suit children's tastes. Overall, it's been a labour of love for Donna with her new businesses and she always gets excited about its prospects. "It's been an adventure, a journey that I get to go on with many families and I enjoy the experience," Donna said.